What is it that you have been focusing and working on in the new year? I’d really love to hear from you, and how things are going. Have you ever taken stock of how much time, mental energy and resources you spend to make yourself feel better, when you are “up against” something? And have you ever considered that a lot of your tiredness comes from resistance? the super glue of the Universe? Most everyone has heard, “What you resist – persists,” because what you resist cannot exist in your world without your resistance. It is the glue that sticks “it” to you. This reminds me of a funny story of me and my mom haggling over my doing – and not doing – my chores as a kid. My job was to iron flat things, like pillow cases and linen dinner napkins. It was a big, Irish Catholic family so there was a lot of ironing to do on a weekly basis. 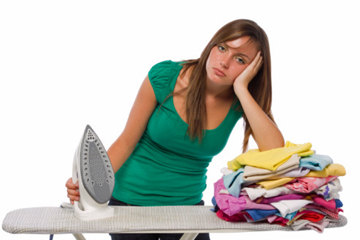 I, of course, hated ironing, and did everything I could think of to get out of it. Being a kid, I didn’t think things through beyond not wanting to do my chores now, so when I would hide a few napkins and pillow cases at a time, it never occurred to me that at some point, 1. I’d get found out and 2. I’d have that much more ironing to do all at once. Eventually it all hit the fan and my mom would be so mad and yelling at me, and I’d be all in resistance and mad at her and it would be one huge, uncomfortable afternoon all around, spoiling both of our days. It only had to happen once or twice before I got it that this strategy was no good, sucked and wasn’t worth the little bit of time it bought me. It was a great life-lesson in resistance, and shenanigans, that would take me years to unpack, and she was so right. It is the resistance that causes the pain, drains the energy, ruins the day, drains the joy and other resources out of a moment, a project and a life. It is the contracting and tightening up that is so painful, though we think it is the thing we are avoiding/resisting that is the draining thing. Ironing wasn’t that hard, or time consuming. Hell, I could even take it all in to the TV room and watch TV while I did it! But my resistance to the ironing – that’s where all the draining trauma/drama happened! Or just ask the Universe – Universe, what would it take for this situation to change in ways I haven’t even thought of, right away, as if by magic? And everything that brings up, will you destroy and uncreate it all times a godzillion? Right, wrong, good, bad, POC, POD, all 9 shorts, boys and beyonds. Creating more space is the purpose of these questions – not more conclusions, assumptions, walls and limits. Create more space, to give the Universe some maneuvering ability. I am doing more FB Live videos on my A Spiritual Perspective page in Facebook and I’d love to have you Like that page, and partake in the “try this at home” videos that I’m creating for that page. Click here to watch one from today on Healing. Call 703-299-9309 to book your session. Come in for an energy healing session, or enjoy a non-verbal, lay back, close your eyes, and let’s defragment your brain and enjoy some profound relaxation with Access Bars session. For those of you not in the local area – if this is the time for you to get a session for yourself, supporting you in new ways in 2019, click here to book your long-distance session now. It’s new year – time to support you in some new – and powerful – ways.